This Black Volkswagen Golf MK5 is lowered on a set of BBS RS Wheels. 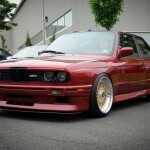 The BBS RS wheels are 17 inches in diameter and have gold faces. The wheels also have BBS RS Half Height Center Caps. This MK5 Golf is really slammed. 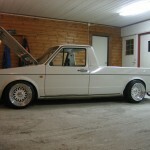 This entry was posted in Volkswagen and tagged 17" BBS RS, Gold BBS RS, MK5 Golf, Volkswagen Golf by admin. Bookmark the permalink.